RapReviews.com Feature for October 24, 2006 - Jibbs' "Jibbs Feat. Jibbs"
"Do your chain hang low? Do it wobble to the flo'? Do it shine in the light? Do your chain.. hang.. low?" Jibbs Jibbs Jibbs! Jibbs? Jibbs. Ladies and gentlemen that was an example of epizeuxis. Put simply, it means repeating one word over and over again for emphasis. The word emphasized in this case is a proper noun, and that proper noun is the name of the rapper being reviewed. Jibbs is his name, and Jibbs is also the name of his album. 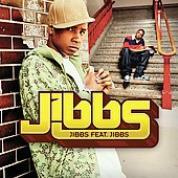 In fact the album Jibbs created is titled "Jibbs Feat. Jibbs." You can't get much closer to epizeuxis in hip-hop than that. Maybe someday DMX will release an album called "DMX on DMX" but for now Jibbs holds the crown as the King of Repetition. It is widely accepted that repetition enhances memory. Jibbs is a firm believer in the philosophy of retention through repetition. The hit single "Chain Hang Low" does all of the hard work of driving home his message, so you won't have to take notes while listening and read them back later to remember what he's about. His chain blings. His chain shines. His chain is so heavy they couldn't lift it without a crane. Da Beatstaz, a team composed of DJ Beats and Reace Beats (they obviously believe in repetition too) hammer this point into your brain with a nursery rhyme hook sung by children and a four note pattern for the verses that loops incessantly over heavy bass. Even if you don't care about Jibbs either way, the song's repetition is so effective makes it impossible to forget about Jibbs and his bling bling. But, right now the boy is on the mission for a million"
It's hard to be memorable with the same topic matter as everybody else. It's not as though Jibbs is in any way an incompetent rapper. His diction is average but has room for improvement. His deep vocal tone reflects his St. Louis background well - a little bit Chingy and a little bit Nelly without necessarily trying to copy either. His rhymes are acceptable albeit entirely generic and run of the mill. The strongest debut on "Jibbs Feat. Jibbs" is therefore not Jibbs himself but that of Da Beatstaz, who work really damn hard to make an average rapper feel like something special and interesting. They rattle the box with "Smile," create a perfect track for flossin' your whip on "Big Big Kid," crunk out the piano keys on "Hood" and go straight loco on "I'm a Rhino." It may be a little late to hop on Da Beatstaz bandwagon in 2006 but in 2007 their services are gonna be in high demand. In conclusion "Jibbs Feat. Jibbs" is not an altogether bad album, but really does nothing to put Jibbs on the map. You could easily substitute any one of a dozen rappers in or outside St. Louis over these tracks and get the same result - anybody from Ali to Cool Breeze to Bubba Sparxxx. Jibbs may in time develop into something special, but Da Beatstaz already are, which suggests this album SHOULD have been called "Da Beatstaz Feat. Jibbs." Epizeuxis may result in an interesting album title, but it doesn't necessarily result in an interesting rapper. If you remember one thing, remember that this album is not a must have and should only be purchased used or while on sale.